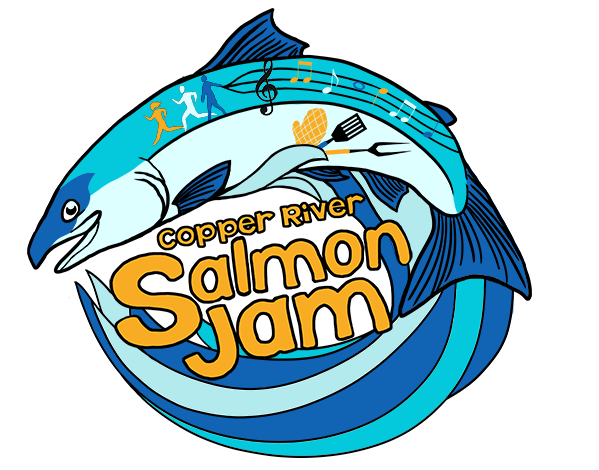 6:00 p.m. | Salmon Jam music festival opens: Get ready to dance! Must have wristband to enter. Enjoy local and visiting performers over the course of the evening while sipping a cold brew from our beer garden (optional!). 6:00 p.m. – 10:00 p.m. | Snack Shack: delicious homemade food including seafood stew, salmon chowdah, pizza and mac & cheese. Hot and cold drinks, too! 9:00 p.m. | Featuring Band warms up the stage. 10:00 p.m. | Our Headliner takes the stage! 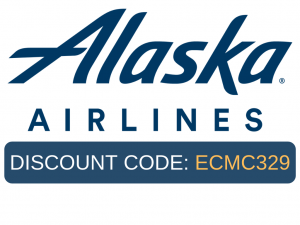 7:00 a.m. – 1:00 p.m. | Alaska Salmon Runs road races: King salmon marathon, Sockeye half marathon, Coho 10K, Humpy 5K, Smolt one-mile walk/fun run. See the Alaska Salmon Runs page for more details. Download a registration form from the sidebar. 12:00 p.m. – 6:00 p.m. | Dumpster Painting: Local artists are invited to paint dumpsters that will be used throughout the community of Cordova. The colorful creations help enhance the vibrancy of Cordova’s streetscapes and highlight local talent. 1:00 p.m. – 3:00 p.m. | Small Fry Activities: Join the Prince William Sound Science Center, Copper River Watershed Project, U.S. Forest Service and their partners in education at the festival grounds for fish printing, relays, casting practice, salmon fillet and preserving demonstrations and other exciting hands-on activities. Free homemade ice cream courtesy of Harborside Pizza. Fun for kids & families of all ages! Arts and Crafts Festival will also be open during this time–-your opportunity to support local artists without having to pay the gate fee! Rain location: TBD. Free for everyone! 4:00-5:00 p.m. | Musician Workshop: TBD Free for everyone! 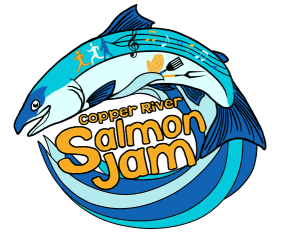 5:00 p.m. – 6:30 p.m. | Salmon Barbecue and Alaska Salmon Runs medal announcements. Dinner is $15/adult, $8/child under 12. Does not include Salmon Jam admission. 5:00 p.m. – 9:00 p.m. | Local Arts and Crafts Festival: More chances to purchase locally-made art, snacks and handicrafts and support our local artists. 6:00 p.m. | Salmon Jam Music Festival: Night 2 kicks off. Local and regional musicians start off a full night of live music! Must have wrist band to enter. 7:00 p.m. | Taste of Cordova Wild Food Cook-off: Enter for your chance to win, or just stop by to try delicious dishes that feature Copper River wild salmon and other local wild foods. Entries must be at ski hill by 6:00 to be judged. Enter a dish and receive a discount at the gate AND be the first in line to enjoy many delicious tastes of Cordova! 6:00 p.m. – 10:00 p.m. | Snack Shack: delicious homemade food including seafood stew & bread bowls, salmon chowdah, pizza and mac & cheese. Hot and cold drinks, too! 10:00 p.m. | Our Headliner rocks the hill!